FunBites Reviews - What Is FunBites And How Does FunBites Work? FunBites Reviews – What Is FunBites And How Does FunBites Work? FunBites are functional and colorful kitchen tools developed to help parents encourage toddlers and preschoolers enjoy meals time and try out a variety of different healthy foods. They are shaped food cutters that cut through fruits, meat, vegetables, sandwich, grilled cheese, burger, deli and pancakes. The cut foods are neat and pleasant bite sizes that are welcoming making eating fun and enjoyable. It is designed in such a way that it cuts through the foods with not much waste. It is made of a material that is user friendly and can also be used by the kids to prepare their own foods or help in meals preparation. It comes in a variety of colors and shapes, which include: square, heart, triangle, minions among others. FunBites is manufactured by FunBites, LLC. This company was founded by Bobbie Rhoad (a mom) and her daughters; Dylan and Jackie and is located at Westport, Connecticut. They can be reached online or connect with them on social media platforms. FunBites are available for purchase online on the manufacturer’s official website, third-party retailing stores and local stores and shops. The manufacturer is offering each FunBites piece at a price of $9.99. They offer free shipping if one purchases 3 or more pieces. FunBites is claimed to be made of durable plastic that is BPA free and easy to use. The plastic used is said to be strong enough to stand any accidental falls. FunBites Review: How FunBites Works? FunBites works by cutting through foods, fruits, meat and vegetables into bite-sized pieces. It has curved blades, which cut through foods all the way down by placing it on your food of choice, pressing down and rocking a few times. It also has a matching proper top that helps eject the cut pieces by pushing down and out pops the pieces. Plastic – It is BPA free, durable and provides protection in case of accidental fall. Blades – It cuts food into small pieces. FunBites Overview FunBites are functional and colorful kitchen tools developed to help parents encourage toddlers and preschoolers enjoy meals time and try out a variety of different healthy foods. They are shaped food cutters that cut through fruits, meat, vegetables, sandwich, grilled cheese, burger, deli and pancakes. The cut foods are neat and pleasant bite sizes that are welcoming making eating fun and enjoyable. It is designed in such a way that it cuts through the foods with not much waste. It is made of a material that is user friendly and can also be used by the kids to prepare their own foods or help in meals preparation. It comes in a variety of colors and shapes, which include: square, heart, triangle, minions among others. FunBites is manufactured by FunBites, LLC. This company was founded by Bobbie Rhoad (a mom) and her daughters; Dylan and Jackie and is located at Westport, Connecticut. They can be reached online or connect with them on social media platforms. FunBites are available for purchase online on the manufacturer’s official website, third-party retailing stores and local stores and shops. The manufacturer is offering each FunBites piece at a price of $9.99. They offer free shipping if one purchases 3 or more pieces. What are FunBites Claims? FunBites is claimed to be made of durable plastic that is BPA free and easy to use. The plastic used is said to be strong enough to stand any accidental falls. FunBites Review: How FunBites Works? FunBites works by cutting through foods, fruits, meat and vegetables into bite-sized pieces. It has curved blades, which cut through foods all the way down by placing it on your food of choice, pressing down and rocking a few times. It also has a matching proper top that helps eject the cut pieces by pushing down and out pops the pieces. Active Key Ingredients Pros and Cons Features of FunBites Plastic - It is BPA free, durable and provides protection in case of accidental fall. Blades - It cuts food into small pieces. FunBites Pros BPA free Easy to use Heavy duty and quality product Gives neatly cut bite sized pieces FunBites Cons It is difficult to wash if not rinsed immediately after use Are there Any Side Effects? It has no side effects. FunBites is a kitchen device designed for use by adults and kids on their own or under the watch of an adult. 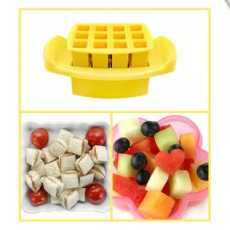 It will help prepare foods, meats, burgers, vegetables and fruits by cutting them into bite sized pieces that are pleasant to the kid’s eyes and easy to put in the mouth, thus making meals time more fun and less time consuming. It is made of durable material that can easily be cleaned by hand or be placed on the top shelf of a dishwasher. Going by how it is helping parents and guardians as well make eating time more fun, majority of the people whose children are picky eaters might end up embracing this gadget. We however advise buyers to research more on its safety, ease of usage and functionality to avoid falling for hype. You should compare its price with that of other cutters available in the market paying attention to materials used, ease in usage, safety and varieties available.